We're your unofficial source for the latest news, rumors, viral marketing, and interviews on the upcoming Disney family action-adventure movie, Tomorrowland! Who are we? We're two fans who met in July of 2013 on an intriguing adventure called The Optimist — an Alternate Reality Game (ARG) in Southern California which acted a prologue to the world of the film. We were quickly captivated by the yet-to-be-released movie, its mysterious backstory, and the incredible team involved in its creation. In a way, this movie brought us together. 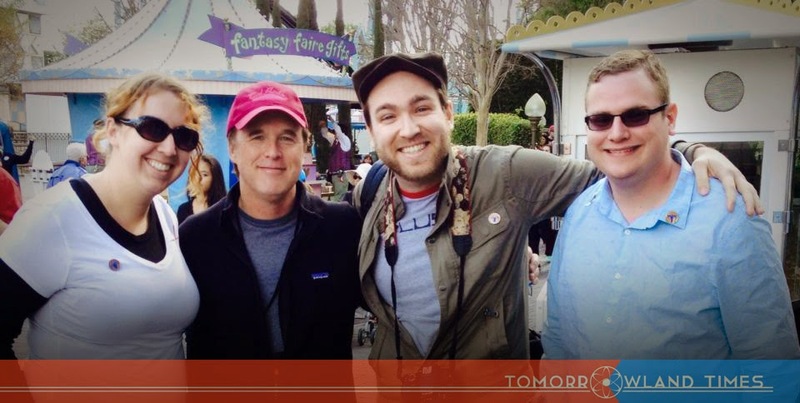 Right to Left: Hastin, Nick, director Brad Bird, and fellow Optimist Katy during Tomorrowland at filming in Disneyland. Over the next year and beyond, we will bring you the latest news, character info, interviews, and more about Tomorrowland. Follow all the futuristic fun here, on Twitter (@TheTomorrowTime) and Facebook. You can also join the discussion and submit new stories on the TomorrowlandMovie subreddit. We invite you to join in the anticipation as we begin this journey to the future! They show just a little of what we saw at D23 in November and additional scenes. I just ordered "Before Tomorrowland" and (of course) am looking forward to the film. I'm half way through Before Tomorrow and it's a great read. If you're trying to decode the last page of the comic at the back of the book, I'll give you a clue and then I'll leave a space with a spoiler warning if you want to know what it says. The clue is on Page 140. Try to decode it on your own. But if you can't wait, there's a spoiler coming up. "Put on your glasses. Look out the window. Bring the comic. We are waiting for you".